I've been obsessed with Michelle Obama's arms, I've envied many a triathlete's guns (something about those muscles that look even more defined after perching in aero position for 112 miles), and I've engaged in plenty of yoga sculpt classes in hopes of scoring my own envious arms. But in all honesty, it was probably more for show than for utilitarian value. Even so, I know the importance of arm muscles for the sports I partake in, not excluding skiing. I like to think of it this way: You never know when you'll need to use your poles like a Nordic skier. I've been practically stranded in Vail's back bowls and felt my arms burning as I furiously used my poles to traverse the flat (or what felt like it) Silk Road. I've high-tailed it on Cloud 9 in Blue Sky Basin to the China Spur on the other side of the mountain. I've felt the arms burn on the cat track that I want to traverse in a hurry: I'll skate, I'll pole, I'll don my best Nordic skier interpretation all in the name of reaching my destination faster. Now those are all situations I've found myself in where a little arm strength does the body good. But how about an example that we've probably all felt at least once in our lives? The "I've fallen but I can't get up." Sure it's a phrase we memorized from those lifeline commercials, but you don't have to be old, living alone and unsteady on your feet to utter the phrase while you're skiing. Take my mom who I got on skis for the first time in seven seasons back in March. She toppled over not once, not twice, not three times. Totally understandable considering she hadn't skied in years and was even more rusty than her last attempt. But when tipped over, she couldn't get herself back up. These weren't difficult falls to recover from, it's just that she lacked the arm power to push herself back up and couldn't leverage herself with her poles. Instead she had to pop her skis off (or rather I did it), stand up and start all over. A situation that easily could have been avoided. The fix? Stronger arms. The benefits? Sculpted muscles, longer ski days, less arm burn so you can expend more energy in the legs--and maybe even sporting those killer arms when you're chillaxing in the hot tub. How? 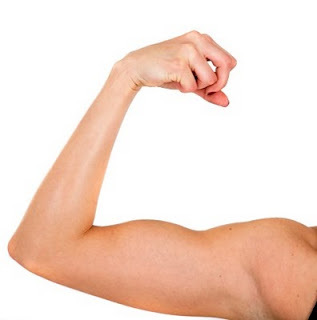 Buzz.snow.com lays out some exercises to start with that'll shape and strengthen your biceps, triceps and deltoids--and maybe a few others, too. It'll all in the name of toning your arms for skiing. What moves do you use to max out your arm muscles?